Chicago author Chris Mendius earned a BSME from University of Illinois in Champaign-Urbana and an MBA from University of Chicago. He started writing after college and produced a terrible screenplay, a mediocre first novel and some decent short stories. He finally hit a bullseye with Spoonful , a story influenced by his own experiences living in Bucktown in the late '90s and drawing on his sordid past to provide its authenticity. The book was released by local press Anything Goes Publishing LLC in February 2012 and awarded the Kirkus Star of Remarkable Merit. Chris lives with his family in Oak Park. Spoonful is his first published novel. 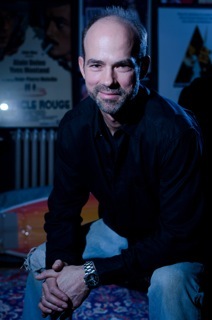 Hear Chris read on Tuesday, May 1 at 7:30 p.m. at Hopleaf's upstairs bar! You may be sick of hearing about this, Funkers, but you have less than 36 hours left to help fund the Kickstarter campaign for this September's Chicago Writers Conference. They still have more than $1,500 to raise to meet their funding goal. We've told you already why you should support it. Now it's your turn to just do it. Please hurry. 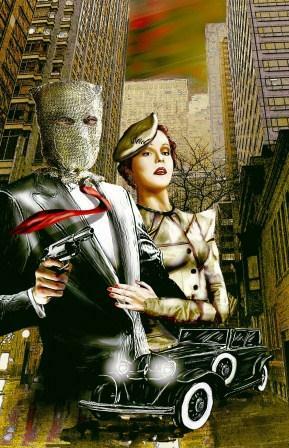 Tom Underberg writes speculative fiction and raises children. He also obsessively documents bricks, sidewalks and manhole covers for his blog on invisible infrastructure. Before his twins were born he had real jobs in software and consulting. He lives with his wife and children in Evanston in an old house with a big porch. Hear Tom read on Tuesday, Monday 1 at Hopleaf's upstairs bar at 7:30 p.m.
Hi, Funkers. We're not going to make another long pitch here. We're just going to note that, if you're a writer in Chicago, you need the Chicago Writers Conference. And the Chicago Writers Conference needs you back. Only five days remain in their Kickstarter funding drive, and there's still more than $2,500 left to be raised. The conference only gets funded if the campaign reaches its goal, so please please help! So please, again, dig deep and DONATE NOW. Julie Rosenthal is a freelance writer in Chicago. Her fiction has been recognized by ChiZine and has appeared in Kaleidotrope, A cappella Zoo, and Columbia College's annual Story Week Reader. Another story is forthcoming later this year in Breaking the Bow, an anthology from India-based Zubaan Books. She is working on a novel about the unsolved murder of King Edward the Martyr of England. Julie adds, "Thanks very much to Bill and Sara -- and to all of the loyal supporters of Tuesday Funk." 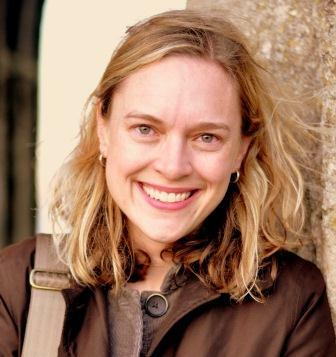 Hear Julie read Tuesday, May 1 at Hopleaf's upstairs bar at 7:30 p.m.
Susanna Lang's first collection of poems, Even Now, was published in 2008 by The Backwaters Press. A chapbook, Two by Two, was released in October 2011 from Finishing Line Press, and a new collection, Tracing the Lines, will be published by Brick Road Poetry Press in fall 2012. 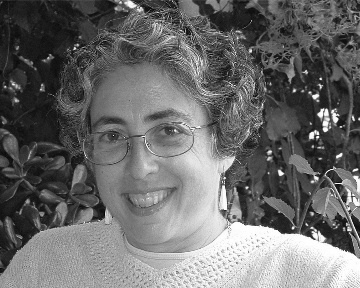 She has published original poems and essays, and translations from the French, in such journals as Little Star, New Letters, The Sow's Ear Poetry Review, The Green Mountains Review, The Baltimore Review, Kalliope, Southern Poetry Review, World Literature Today, Chicago Review, New Directions, and Jubilat. Book publications include translations of Words in Stone and The Origin of Language, both by Yves Bonnefoy. She lives with her husband and son in Chicago, where she teaches in the Chicago Public Schools. Hear Susanna read on Tuesday, May 1st at Hopleaf's upstairs bar at 7:30 p.m.! There's a strong spring wind blowing a great evening your way! 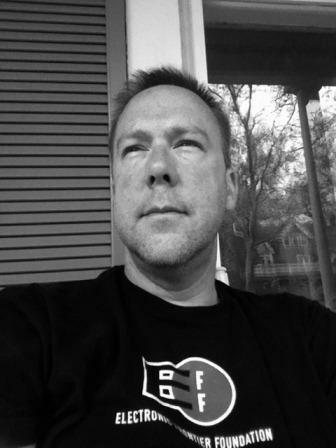 Our 45th episode of Tuesday Funk will feature readings from Chris Mendius, B.C. Bell, Susanna Lang, Julie Rosenthal, and Tom Underberg! You'll also get a new Poem By Bill, not to mention your pick of dozens of varieties of cold beer at the bar. 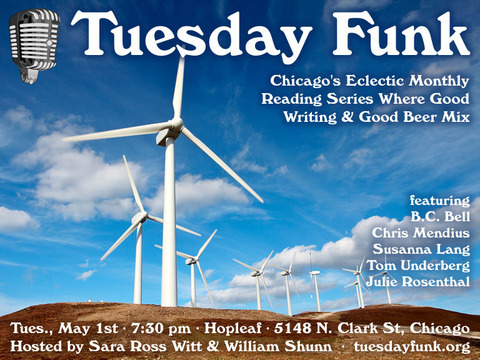 The evening gets underway with your co-hosts Sara Ross Witt and William Shunn on Tuesday, May 1, 2012, 7:30 pm, in the upstairs lounge at Hopleaf, 5148 N. Clark St., Chicago. Arrive early for a seat, and grab a beer from Johnny at the cash-only bar. We start seating at 7:00 pm and no earlier. Admission is always free, but you must be 21 or older. And come early or stay late after for some great Belgian-style food downstairs.